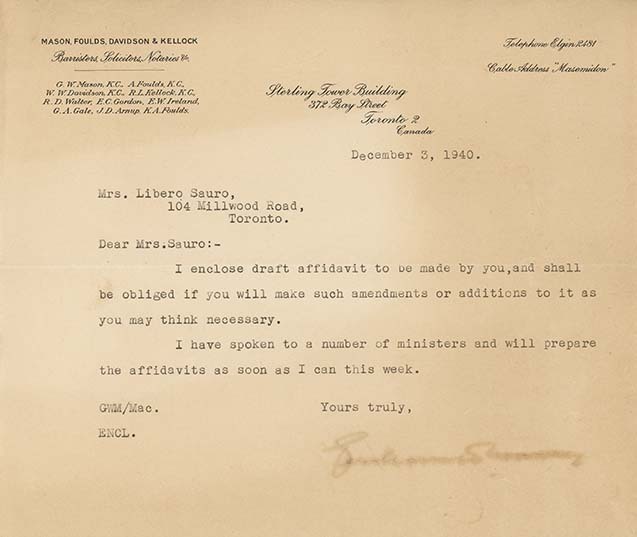 Letter from Mason, Foulds, Davidson & Kellock (Barristers, Solicitors, Notaries), to Mrs. Libero Sauro, December 3, 1940. From his arrest, Clementina was relentless in her mission to have her husband released. She wrote many letters on his behalf, including letters to M.J. Coldwell and J.S. Woodsworth, her husband's colleagues at the United Church, and others. To assist in this process, some educated and established internees were able to hire lawyers to represent them during their hearings with an appointed judge. Legal counsel was not available to the majority of internees. Many families hired lawyers at great cost. The Tiezzi family received a $2000 bill -- an even more significant amount in the 1940s. This letter refers to affidavits, including one by Clementina, some of which are available in the collection (see ICEA2010.0008.0012.a-c, ICEA2010.0008.0018.a-b, ICEA2010.0008.0020, ICEA2010.0008.0019, ICEA2010.0008.0017, ICEA2010.0008.0016, and ICEA2010.0008.0015).